Two weeks on from the 317 service’s renewal, Ferniegair councillors have been speaking out about the route’s importance to the local community. First Bus axed the 231 from Lanark to Hamilton to coincide with changes to their January timetable. The 231 route was one of a number of routes cut by First Bus in their reshuffle. Strathclyde Partnership for Transport has since stepped in to replace the service and it is being operated by Stuart’s Coaches. 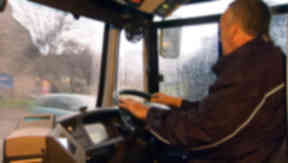 Councillor Davie McLachlan, the former chair of bus operations at SPT said: “The above service has been taken over by SPT on a subsidised basis and the officials at SPT recognised that there was a solution to replace the previous service that was withdrawn due to low passenger numbers using the service. “When I became a Councillor for the village of Ferniegair I was chair of Bus Operations at SPT and worked hard to find a way of providing a service that would pick up within the village, a service that had been requested for many years but had not been put in place due to the projected low passenger numbers. “In my position I was able to negotiate with my senior staff a way of providing a service to the village on a one year contract and at that time the numbers were low, as expected. However I was able to negotiate an extension and the service remained for another year but was eventually withdraw in July 2010. He continued: “Having made such an effort to get the service in the first place the officers at SPT, through the re-configuration of other services and new tenders, were able to introduce a replacement service to the village at no extra cost and without causing disruption to timetables. “This came about due to the Bus Operations staff being aware of the situation through my previous interventions and was not as a result of petitions or any other pressure by members of the public or the Council. The number 317 is now operated Monday to Saturday off peak hours via Castlehill Crescent in Ferniegair and will replace the withdrawn subsidised 299 service in the area. Councillor Barry Douglas said: “Whilst Carlisle Road in Ferniegair has regular buses to and from Larkhall and Hamilton, and Chatelherault train station provides a link to Larkhall, Hamilton and Glasgow, the topography of the settlement means the largely elderly population in the village cannot easily walk to the railway station or to Carlisle Road to access public transport. “Locally the “Village” refers to the community situated on Clyde Avenue, Park Drive, Ross Terrace, Fairholm Avenue and Castlehill Crescent and this part of Ferniegair is accessed via Valleyfield Avenue that was constructed for accessing the village due to building of the railway line. This change saw the original access road into the village at Clyde Avenue being closed off. He continued: “Valleyfield Avenue is on a steep gradient that many of the elderly villagers struggle to walk up or simply cannot negotiate by foot. In winter months this hill can be treacherous and without a Bus Service many of my elderly constituents were house bound this winter. “Whilst the village has a large elderly population, it has a very active community and the Pensioners Association meets in the Ferniegair Hall every fortnight. Councillor Mary Smith also welcomed SPT's renewal of the service. The new 317 service runs from Monday to Saturday from Ferniegair to Hamilton from 8.57am until 2.57pm. From Ferniegair to Larkhall/Clyde Valley/Lanark 9.29am hourly until 4.29pm.